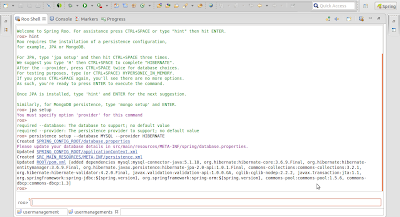 Spring Roo simple hello world example in STS - What is spring roo ? Today we are going to discuss about Spring Roo, in this blog we will come to know what spring roo is ? and how can we use it in a productive environment to achieve industry best practices. 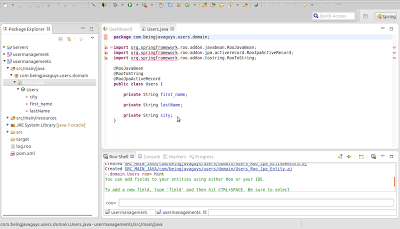 We are going to implement a simple spring mvc application using spring roo and come to know about automatic creation of domain, controller and views in our application. 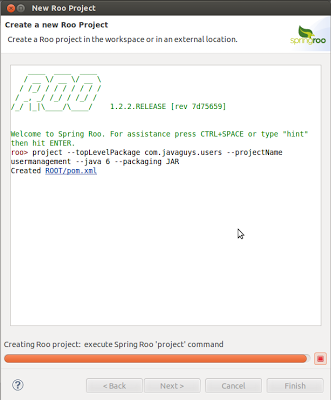 Roo makes application development easy in a fundamental and sustainable improved way without compromising to productivity, engineering integrity and flexibility. It means that spring roo makes you implement your business ideas implementation fast and easy. 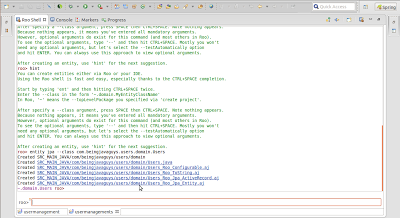 The most interesting part of spring roo is that you are not bound to accept the generated code as it is, rather you can change the code at any point of time to make it fit according to you needs. What is Spring Roo ? 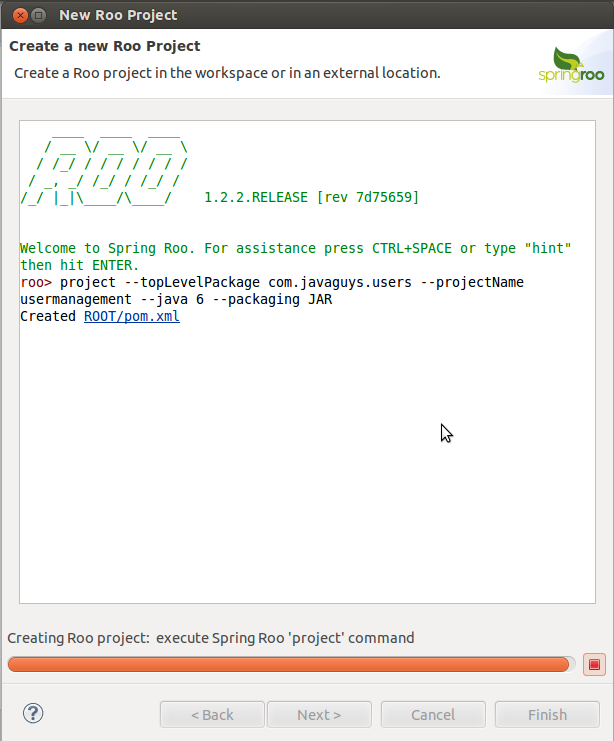 Spring roo is simply a tool that sits there in the background and handles the things that you do not want to worry about. 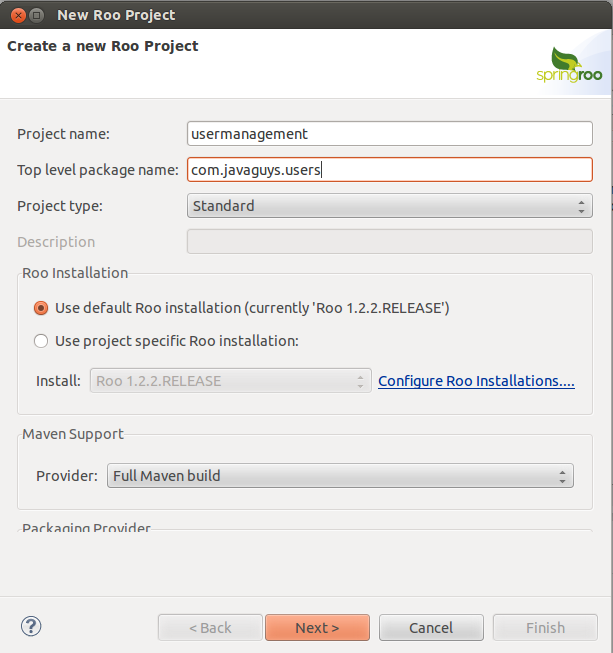 Using Roo you can focus on your domain model and business need and everything else will be handled by spring itself. 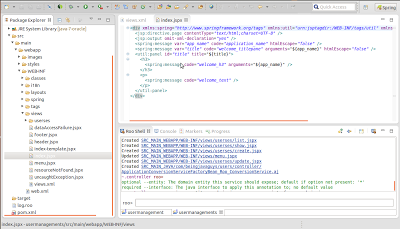 There is no roo.jar dependency to add in your application explicitly, so it is purely a tool that helps you things going with a less effort. 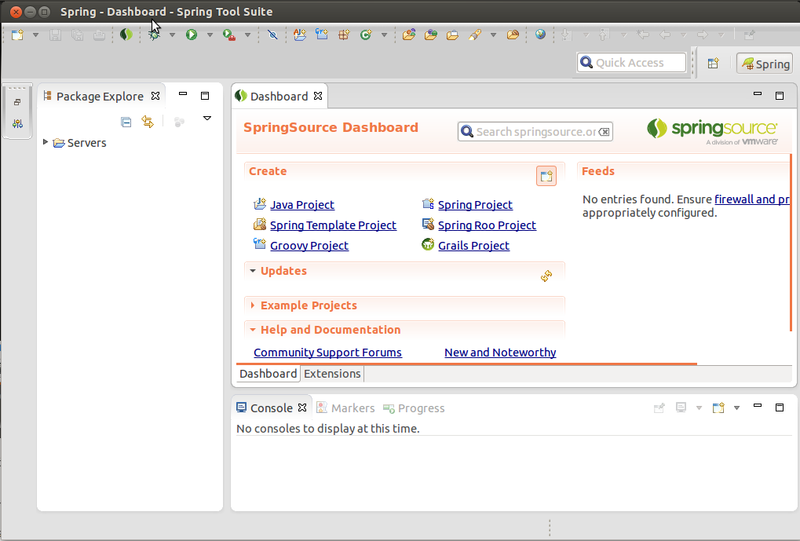 Spring Roo simply makes the developer's work easy without getting in their way. 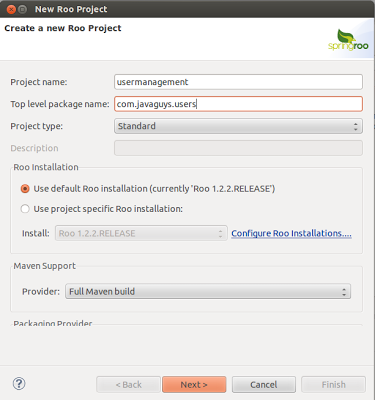 Roo provides tools to fetch the application out of it completely and after that you are free with your application to use any coding patter you choose or any technology you want to add to your application. 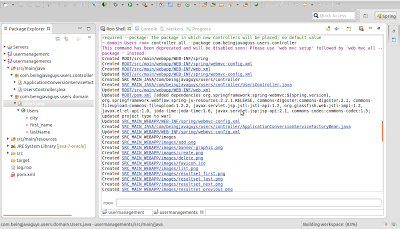 If you are using STS you do not need to add something else, everything is already added to it for you to start working with roo. STS has almost every plugin installed in it that you would typically need and you can add more plugins to it as per your need. 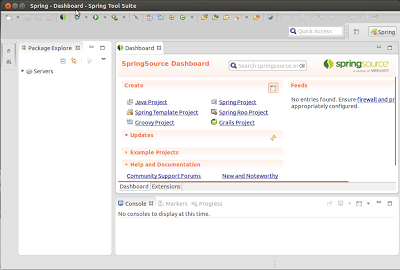 STS is based on Eclipse IDE with a better Spring MVC development environment. 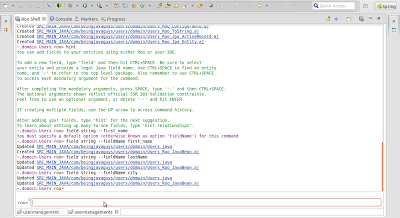 Click finish and it will create a project ready for us, a project in typical maven style having a pom.xml in it. Now the wondeful thing about roo is that it will guides you through the project creation process, every time. 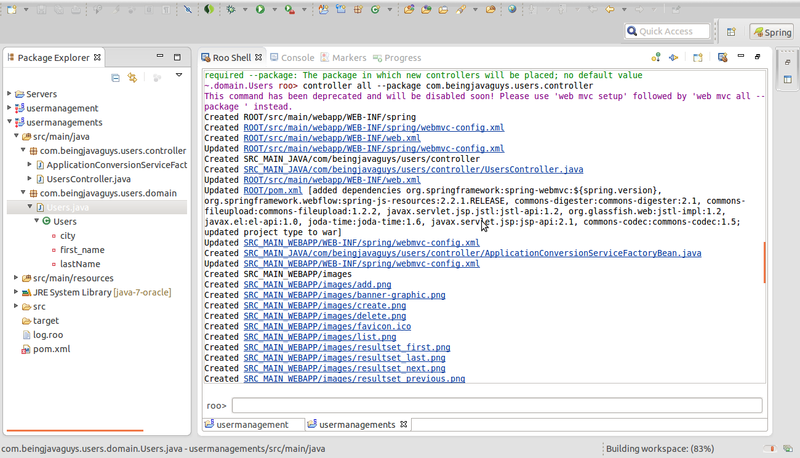 If you do not know what to do, just write hint in roo shell and you will get things to choose like the screen below. 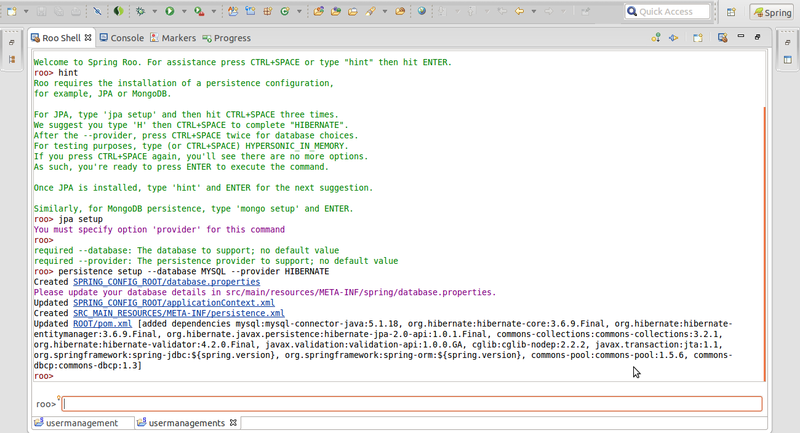 Provider means the jpa implementation that you want to use, for now lets choose hibernate and click ok. Roo will add all required dependencies according to your db and Jpa. 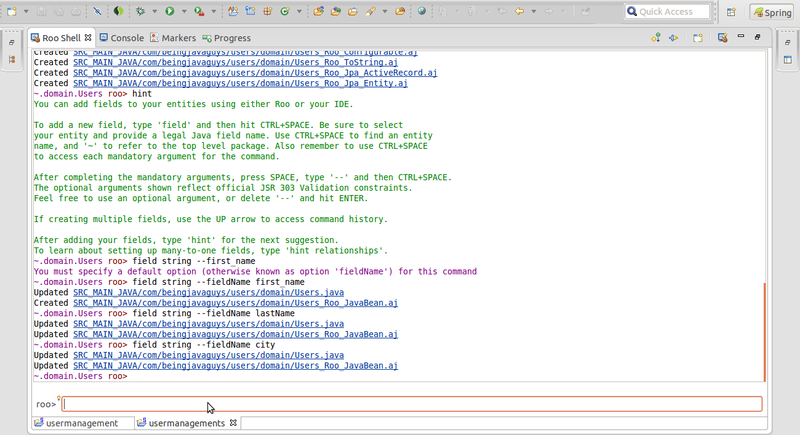 Use Ctrl+Space every time to get a autocomplete for your commands. Don't know what to do next ? No worries ! 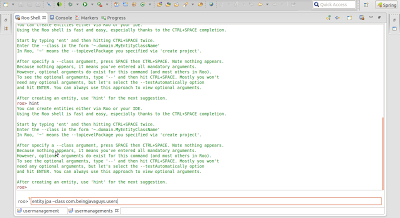 Just ask roo again what to do now, simply write hint again and hit enter. Its suggesting to add some fields to your database table, simple write fields and Ctrl+space. 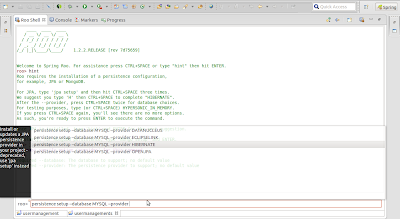 Choose a datatype for your field from list of parameters and give a name for field. 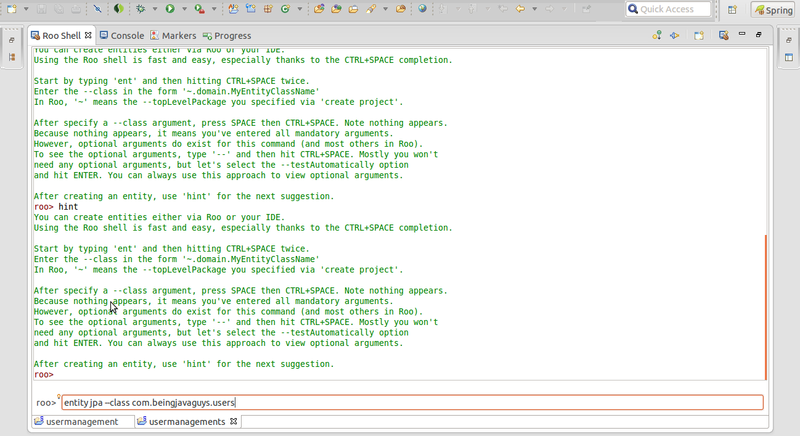 Every time you want to see available parameters or command list hit Ctrl+Space and choose one from suggesting list. 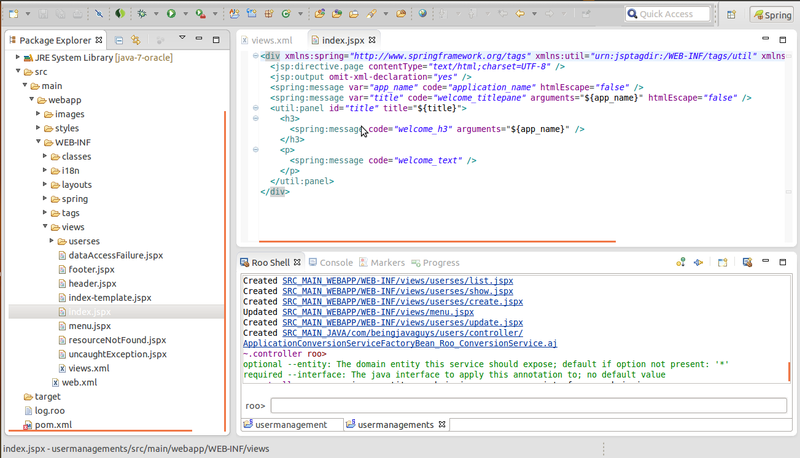 Note that the generated code for domains, controller and views can be edited manually at any point of time without any interrupt. 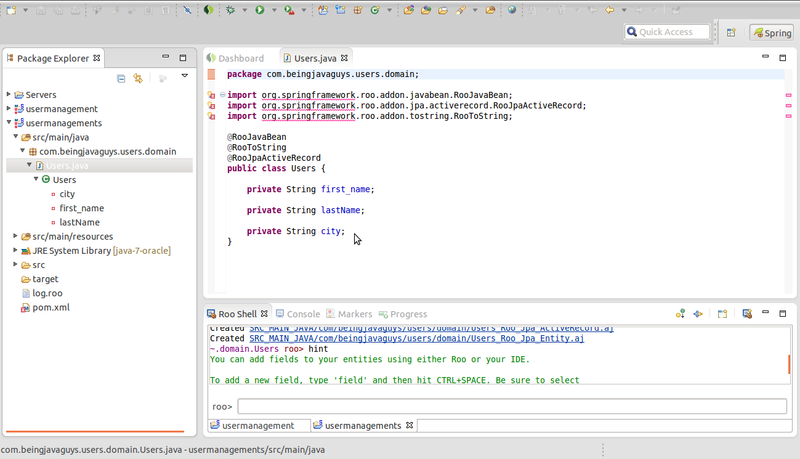 This way with roo we can add all files to our project on the fly and these files can be edited and more code can be added later on to make all these stuff working according to your business need.